East Texans claim Dallas-Big "D," as we once said-so a story of the Cotton Bowl falls into our area; well, at least the stadium is located in Dallas' east side, in Fair Park. Liza Maxwell's excellent article in the New Handbook of Texas tells that story. That site hosted earlier statia as well, including a preliminary wooden structure erected for a prizefight in the 1890s. A 15,000-seat stadium constructed in 1921 for football was used during the 1920s, and then in 1930 construction on the Fair Park Bowl began. This latest facility was created around a doughnut; that is, dirt excavated from the middle to the sides supported seating and left the playing surface 24 feet below level ground and seating-for about 40,000 spectators-15 feet above ground. In addition to football games, Fair Park Bowl hosted outdoor drama during the Texas Centennial Celebration and an address by President Franklin D. Roosevelt in 1936. The leadership of oilman J. Cutis Sanford produced the first Cotton Bowl Classic game in the stadium on January 1, 1937, and although Sanford lost money while promoting the game for several years, the stadium eventually acquired the name of its most famous activity. "Sanford's Folly" became a community asset following an arrangement that led to the champion of the Southwest Athletic Conference playing in the annual New Year's Day Classic against another conference champion or outstanding independent college team such as Notre Dame. In addition, Southern Methodist University and three professional teams, including the Dallas Cowboys, played there awaiting their own stadiums or moving on to other cities. The Cotton Bowl Classic "sold out" by the 1940s and getting to play in its annual bowl game became Holy Grail for every Southwest Conference team. By the 1950s the Cotton Bowl ranked equally with other holiday classics such as the Orange Bowl and the Sugar Bowl, as all three strove to one day equal the Rose Bowl in prestige. Then entrepreneurs and the NCAA proliferated bowl games and spread them from mid-December to mid-January. 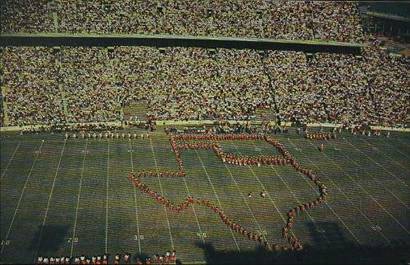 The Southwest Conference dissolved, robbing the Cotton Bowl of its glamour among Texans, its natural constituency. Worse, collegiate football developed a formula for pitting highest-ranking teams in a single bowl game to determine a mythical national championship in lieu of a true playoff system. All these forces diminished the prestige of Dallas' Cotton Bowl Classic. One day each fall, the old stadium rocks again during the annual Longhorn-Sooner shootout, awakening the ghosts of Doak Walker and Slingin' Sammy Baugh, and the spirits of Roger Staubach and Don Meredith. A timely gift for any East Texan. Sample a little of East Texas here, a little there--and come away with a good helping of stories you might not know if you didn�t read this book.